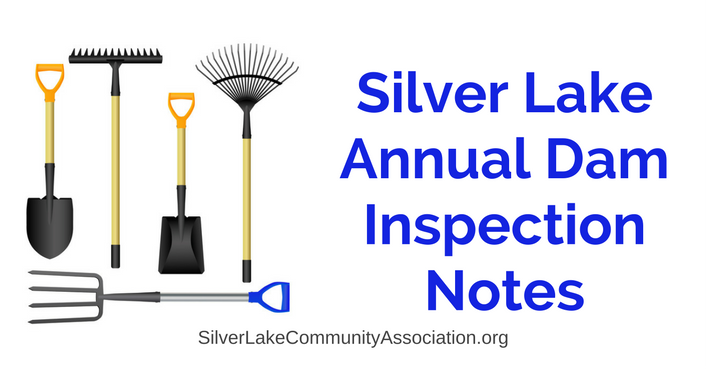 The Silver Lake Community Association (SLCA) is required by the Department of Environmental Protection (DEP) to have an engineer inspect our dam and spillway annually and submit a written report to the DEP by year end. The SLCA Board of Directors in 2017 engaged a new engineer to perform the inspection, as our prior engineer from ARM Group passed away unexpectedly this spring. This was a time consuming endeavor, as we are anxious to move forward with dam rehabilitation projects. We searched for and engaged an engineer with demonstrated experience both in dams such as ours and rehabilitation project management that meets DEP standards. We are delighted to report that the inspections are complete and the report has been submitted timely to the DEP. The 2017 SLCA dam inspection noted that the conditions of our dam and spillway remain consistent with prior inspections. We will be required to do more maintenance, as we always are, in the areas of animal burrows, vegetation control, and minor caulking and cement repairs on the spillway. This is all good news. The SLCA Board thanks all members who turned out with us in 2017 for dam and common area maintenance projects, and we look forward to robust community support in 2018.